We’d love your help. Let us know what’s wrong with this preview of Life of Heber C. Kimball by Orson F. Whitney. To ask other readers questions about Life of Heber C. Kimball, please sign up. It is one thing to read an old book. It is altogether a different experience reading a first edition of an old book. Last year, Jamie's grandmother gave her as a present this book, which had been passed to her from her parents several decades ago. Simply opening the book transports you in time: the smell, the feel, even the weight. And while the book is in remarkably good condition, considering it is 126 years old, part of the binding is coming off, revealing portions of what appears to be an ad It is one thing to read an old book. It is altogether a different experience reading a first edition of an old book. Last year, Jamie's grandmother gave her as a present this book, which had been passed to her from her parents several decades ago. Simply opening the book transports you in time: the smell, the feel, even the weight. And while the book is in remarkably good condition, considering it is 126 years old, part of the binding is coming off, revealing portions of what appears to be an ad from a furniture company that was located on 37 South Main Street in Salt Lake City, promising "prices far below what...been used to paying" and a larger stock and "accessories that cannot be beaten." This is as close as you get to time travel in my opinion. 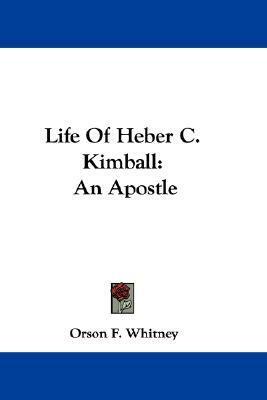 To the substance of the book itself, I thoroughly enjoyed Orson Whitney's rendition of Heber C. Kimball's life. Orson--the son of Helen Kimball, one of Heber's daughters who was a polygamous wife to Joseph--was a preeminent figure in Mormonism at the turn of the century. He developed his skills in reporting early, working for Deseret News for two decades and eventually serving as a church historian. and finally apostle. Without a question, the book is hagiographical, but beautifully so. It is almost poetry, and I perceive the role Homer's Odyssey and Shakespeare played in mid-19th century schooling. It is fun, dramatic, and enjoyable. Heber C. Kimball (and his wife Vilate) was amazing! The gospel "burned like fire in [his] bones." This is an uplifting biography and reading it made me want to be more devoted to the Lord and His gospel. This was fantastic. I read it as we traveled through England studying LDS Church History. It contains so many stores quoted elsewhere. It is very well written and full of faith promoting stories. This is a book I put off reading for years. Now...I'm almost sad I finished it and will have to put it back on its shelf, but...now it is full of notes and marked pages! Heber C. Kimball was such an extraordinary man. After reading his life history, I have such immense respect for him. The stories of his missions to England are unbelievable! As the first missionary to England, he baptized 1,500 people in 8 months. His love and devotion to the church, his love and admiration for Joseph Smith, for This is a book I put off reading for years. Now...I'm almost sad I finished it and will have to put it back on its shelf, but...now it is full of notes and marked pages! Heber C. Kimball was such an extraordinary man. After reading his life history, I have such immense respect for him. The stories of his missions to England are unbelievable! As the first missionary to England, he baptized 1,500 people in 8 months. His love and devotion to the church, his love and admiration for Joseph Smith, for his family is admirable. He had the gift of prophecy. I have had a hard time understanding the principle of polygamy, but as I read of his account, and the struggle he had to accept it (and his wife Vilate)..was so touching, I cried while reading! I hope to meet Vilate one day. "I will try to keep my eye on the mark, that is, Christ, the Son of the living God, His grace assisting me." Story of Heber leaving for his 2nd mission. He was very ill, and all of his family. His wife was in bed and all the children sick, with only one little one well enough to carry a little water.."It was with difficulty we got into the wagon, and started down the hill about ten rods; it appeared to me as though my very inmost parts would melt within me at leaving my family in such a condition, as it were almost in the arms of death. I felt as though I could not endure it. I asked the teamster to stop, and said to Brother Brigham, "This is pretty tough, isn't it; let's rise up and give them a cheer.' We arose, and swinging our hats three times over our heads, shouted: "Hurrah, hurrah for Israel." Vilate, hearing the noise, arose from her bed and came to the door. She had a smile on her face. Vilate and Mary Ann Young cried out to us: "Goodbye, God bless you." We returned the compliment, and then told the driver to go ahead. After this I felt a spirit of joy and gratitude, having had the satisfaction of seeing my wife standing upon her feet, instead of leaving her in bed, knowing well that I should not see them again for two or three years." Speaking of the future: ". . . the time is coming when we will be mixed up in these now peaceful valleys to that extent that it will be difficult to tell the face of a Saint from the face of an enemy to the people of God. Then, brethren, look out for the great sieve, for there will be a great sifting time, and many will fall; for I say unto you there is a test coming, and who will be able to stand?" It was the view of Pres. Kimball that the angels are daily around us. Says he: "His angels are our associates, they are with us and around about us, and watch over us, and take care of us, and lead us, and guide us, and administer to our wants in their ministry and in their holy calling unto which they are appointed." I highly recommend this book. It is written in a very old and flowery style..but is well worth it. As I got into reading it, I delight to find descriptions of several notable events in the early history of the Church of Jesus Christ of Latter-Day Saints. I was impressed as I read at how often he made prophecies that were fulfilled. "No man, perhaps, Joseph Smith excepted, who has belonged to the Church in this generation, eve As I got into reading it, I delight to find descriptions of several notable events in the early history of the Church of Jesus Christ of Latter-Day Saints. I was impressed as I read at how often he made prophecies that were fulfilled. "No man, perhaps, Joseph Smith excepted, who has belonged to the Church in this generation, ever possessed the gift of prophecy to a greater degree than Brother Kimball. (Kindle Locations 5285-5287). I agree with the description that this is a historical work. However, I should mention that it is not a "rare" book, for it is available as a Kindle edition. I alternate between reading the electronic copy, and my 1974 "Fifth Edition". The Kindle has one appendix, which is an experience of David Patten Kimball lost in the wilderness. The printed edition has appendix 1-3 concerning the Ancestry of Heber Chase Kimball. Printed appendix 4 is an "Address to my children." A very interesting book, in both format and content. There are passages and quotes that really make you stop and reflect the knowledge, obedience and faith of the early members of the Church. A lot of passages and quotes that you also won't hear during Sunday School. The author, Orson Whitney is one of Heber's grandsons. The style of prose is too flowery and verbose, but if you can sift through the language, it's worth the time and effort. This book is defiantely a classic. It is the early church history from another point of view. Heber C. Kimball was very close to the prophet Joesph Smith. Thus, very involved in the developing history of the church. I enjoyed this book because there were several inspirational stories that I had not previously known. He was a very humble and obedient man. I was impressed with his prayers and prophecies. He was an amazing dedicated man that we simply do not hear about in Church History. It is because men like Heber C. Kimball who was so obedient that the church is where it is today. I wish I was as obedient & stalwart! A good resource for learning more about Heber C. Kimball and the early church. Readability suffers a bit from the wordy, flowery style. It also ends up having to recap a lot of basic church history in order to make sense of Heber's life. A great man, and I wish I had a better complete image of who he was. The excerpts from Kimball's journals were wonderful, the writing of Orson F. Whitney less so. I am certainly no opponent of panegyrics, but I suppose they are perhaps less useful as history. An inspiring biography of this LDS Apostle. I especially loved the part detailing his missions to the British Isles. He was perhaps one of the most successful modern-day missionaries for the Mormon Church. The parts from HCK's journal are really interesting. His Grandson said, "A braver man probably never lived than Heber C. Kimball." I don't know if that is true or not, but I know he was a great one. This book provides interesting insights into Heber C Kimball's life. However, it has some obvious inaccuracies. This book was originally published in 1888. I have a copy of the fourth edition which was published in 1973. This is a faith promoting book! This book is in my top five! This was an excellent account of Heber C. Kimball, another witness of Jesus Christ. Orson Ferguson Whitney was a member of the Quorum of the Twelve Apostles of The Church of Jesus Christ of Latter-day Saints (LDS Church) from April 9, 1906 until his death.